Specificity: Recognizes the Rpt4/S10b subunit of the 19S regulator complex. Application Notes: Single dimension SDS-PAGE of proteasomal preparations from a variety of sources followed by Western blotting gives a single band with a relative molecular weight of approximately 44kDa. Formulation: Liquid. Contains 10mM sodium azide. Scientific Background: The proteasome is widely recognised as the central enzyme of non-lysosomal protein degradation. It is responsible for intracellular protein turnover and it is also critically involved in many regulatory processes and, in higher eukaryotes, in antigen processing. The 26S proteasome is the key enzyme of the ubiquitin/ATP-dependent pathway of protein degradation. The catalytic core of this unusually large (2000kDa, 450Å in length) complex is formed by the 20S proteasome, a barrel shaped structure shown by electron microscopy to comprise of four rings each containing seven subunits. Based on sequence similarity, all fourteen 20S proteasomal subunit sequences may be classified into two groups, α and β, each group having distinct structural and functional roles. The α-subunits comprise the outer rings and the β-subunits the inner rings of the 20S proteasome. Observations of the eukaryotic proteasome and analysis of subunit sequences indicate that each ring contains seven different subunits (α7β7β7α7) with a member of each sub-family represented in each particle. Each subunit is located in a unique position within the α- or β-rings. In addition to the 20S particle, the 26S complex contains over twenty additional proteins, ranging in molecular weight from 25 to 10kDa, located in a distinct complex called the ‘PA700 proteasome activator’ or the ‘19S complex’, and which determines substrate specificity and provides the multiple enzymatic functions necessary for proteolysis and viability. Systematic analysis of the sub-unit components have revealed at least six members to be ATPases belonging to a new family of ATPbinding proteins, together with a further fifteen sub-units that lack the capacity to bind ATP, isopeptidases and several other proteins thought to be responsible for the unfolding of a protein substrate prior to insertion into the proteolytic core of the 20S proteasome. 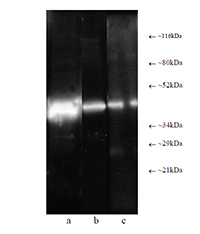 Western blot analysis: Composite luminograph of (a) HeLa S3 cytosolic preparation, (b) purified 26S proteasome, and (c) human placental proteasomefraction after SDS PAGE followed by blotting onto PVDF membrane and probing with antibody BML-PW8830. Antibody dilution 1:5000 using ECL procedure (1 min exposure).